The Kokopelli symbol of the American Southwest is ubiquitous in the region, appearing on everything from road signs to dinner napkins and from salt shakers to earrings. It is has become so prevalent that it is nearly synonymous with the southwest and the indigenous Native American peoples who have called these rugged and beautiful areas their home. Dating from a period that ranged from 900 to 1400 CE (i.e., the Common Era, previously known as AD), the rock art and pottery of the Greater Southwest is replete with Kokopelli images created by the ancestors of modern Pueblo peoples. Although Kokopelli portrayals will naturally vary in each use, he is always the humpbacked flute player. Seen in profile, with his rounded back, his arms extend outward, grasping a flute as he plays it. Often his giant phallus could also be seen and he was generally portrayed upright, sometimes walking, dancing, and even hunting. Occasionally, he has also been seen seated and reclining, though not often. In one of the stories, there was a beautiful and vain maiden who declined marriage proposals of all the young men from the village. The Kokopelli hid himself among the bushes and impregnated the beautiful maiden using trickery. The villagers, after trying in vain to find out who the father of the child was, devised a game in which they invited all the young men to race and get a flower for the child to decide the paternity. The child did not accept anyone’s flower but when Kokopelli gave it a flower it accepted, thus laying to rest the question of the child’s father. Another legend also states that the Hopi also referred to a fly as the Kokopelli, as this fly was known for its ardent nature for reproduction. 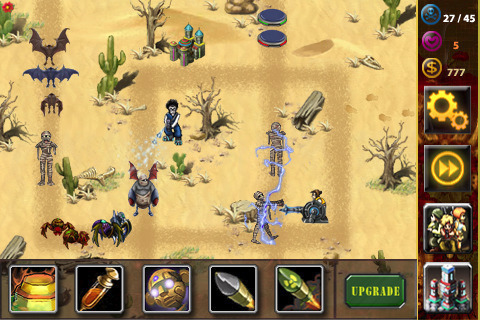 The Kachina dancers appearance, with their masks, feathers and coloring, also suggest that the Kokopelli is an insect. Some legends say that the Kokopelli is a hunchback flute player with a sack of seeds on his back, and he goes around playing his flute, changing winters into spring. The ancestors of the Pueblo Native American Indians believed that they could hear the Kokopelli playing his flute in the spring breeze. The villagers used to sing and dance throughout the night when they heard the flute and every maiden in the village would be pregnant in the morning. The Kokopelli, also known as the Kokopilau, was also believed to be an Aztec trader, with the hunch back signifying a sack of goods and the playing of flute a way to draw attention. The Kokopelli tribal tattoo has different legends and signifies different things to different people. Women having problems conceiving mark themselves with the Kokopelli tattoo hoping it will bring them fertility, while for others it is the assurance of growth and prosperity. Some like to identify themselves with the idea of a traveling musician. Originally a native American symbol of a hunch backed flute player, this tattoo design has transcended boundaries and finds its place on the bodies of people across the globe. 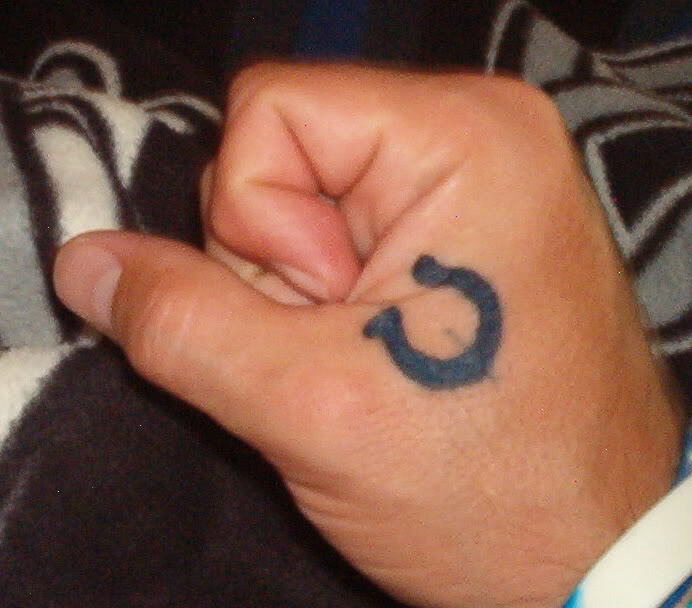 Wrist tattoos and ankle tattoos depicting the Kokopelli are immensely popular. Some depict the hunch back figure with a blowgun instead of a flute and in a hunter’s pose. There are many designs of the Kokopelli with a backdrop of mountains, valleys, rivers and fields, as he was known to be a traveling musician planting seeds, as he went from village to village. 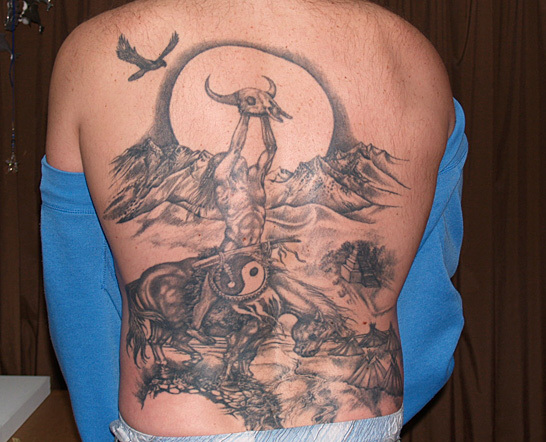 Individuals have also given their personal touch to this tattoo design by mixing it with a deer or turtle, while others have superimposed images of the sun, stars and the moon with the Kokopelli. Free spirited people have even replaced the flute of the Kokopelli with the instrument of their liking. Instruments like bongos, guitars and violins are some of the variations that have been seen. Kokopelli tattoos for girls are also quite common and the tattoo font also varies according to preferences. Businessmen have depicted Kokopeeli Inn, Kokopelli Winery and even Kokopelli Golf Course tattoos on their arms and shoulders expecting it to bring prosperity. The south western native Americans were known for their use of bright colors like red, yellow and orange, so a use of these colors in the tattoos is quite common. The Kokopelli tatttoo is great example of old legends making their way into our modern lives in the form of body art. So if you are thinking of getting a unique tattoo, the Kokopelli tattoo might just be the one for you. 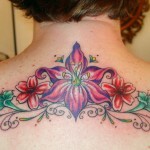 However, remember that tattoos are permanent marks on the body, and cannot be easily removed. Before you get your tattoo, you may want to get a temporary tattoo done, and if you like it, then go ahead with the permanent one. Tattoo aftercare too is an important process that should not be ignored.